OK, Ruthie and I went in last night to give some meds to a couple birds that need their meds twice a day. It all started out innocent enough. Little did we know how that was going to change. I went to BE 05-35's mew to pick him up to take him to the exam table. He needed a shot of baytril and a pill. Eagles aren't fun giving a pill to. Ruthie has more experience than I do in the clinic. She has worked there as a volunteer once a week for a few years. I in turn, don't do just the clinic. I am a jack of all trades and master of none. However, I want more experience handling the eagles. Cassie (my daughter) and I took the handling and restraint class a couple of weeks ago. I am not scared of these powerful and possibly harmful birds, but I do have a deep respect for them. I know improper handling can cause harm to them or the handler. 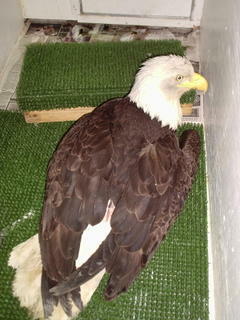 Safety is always an issue when you are having an awake and alert eagle in your hands. Ruthie asked me if I was sure I wanted to get this eagle from his mew. She said he was real feisty. I told her no, I want the experience. The one thing I've learned from aggressive eagles is that once they are tired, they like to lay down. When they lay down they have their legs underneath them. This makes their legs hard to find because you have them covered up with a thick blanket using the Cover Completely Technique. But you need to have a hold of their legs by their feet to pick them up. You definitely don't want to be taloned by an eagle. Things went OK at first. He fought me catching him at first but I was patient and then of course, he laid down. I got lucky and was able to feel down and found his legs in no time at all. I picked him up all wrapped up in a blanket and took him to the exam room. I placed him on the exam table and then we got situated for Ruthie to give him his pill. The eagle is on his back on the table, I'm holding his legs/feet. My arms are on both sides of him and I'm at his tail. The blanket is over his head and also wrapped, covering his wings. Ruthie puts on a leather glove, lifts the blanket enough to uncover his beak and she gets the pill in. Easy enough, right? Nope. We should have known something was up because everything was going too easy. While Ruthie was looking for the proper place to give him a shot of baytril, his head and left wing came out from under the blanket. I know at that time my eyes and 35's were as big as tennis balls. I don't know if Ruthie's were, I never took my eyes off of the eagle. If this wasn't bad enough, he started to flap his wings which made the right wing come out from under the blanket. I'm still holding on to his legs for dear life. In a split decision I decided not to let him go when he started to go for my hands. I slide him off the exam table and stepped out into the middle of the room holding him upside down by his legs. Again he started flapping which did nothing but blow loose papers and stuff across the room. Ruthie grabbed the blanket and started to get herself positioned in front of me and the eagle. In between flapping, 35 was bending up to see what I was doing. This was when Ruthie was able to slide the blanket under him on the floor, then bring it up to cover his head. Once that was done we went back to the table, got him on his back again and covered his head and wings with the blanket. Ruthie traded with me, from the head end she reached around 35 and grabbed his legs. This way her arms kept it's wings folded under the blanket. I found the spot and finally gave him his shot. Ruthie picked him up and got him promptly back to his mew. What seemed like a typical visit to Bird TLC ended up with Ruthie, 35 and I breathing heavy, adrenaline level high, and pumping perspiration. Fortunately no one or eagle was hurt. All the other birds got their meds uneventfully. By the way, we are now up to 38 eagles this year. 2 came in Friday, 1 from Dutch Harbor who ate something a little toxic and 1 from Kenai Wildlife Refuge that was found caught in a trap. More on these two eagles soon.